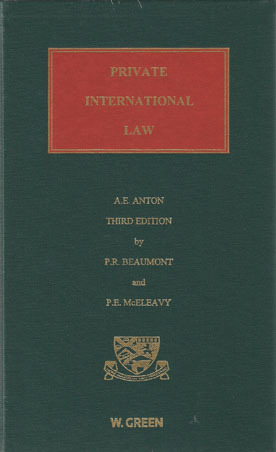 Recently, the 3rd edition of Professor Anton’s standard text on the Scottish rules of private international law has been published. The book has been completely revised by Professor Paul Beaumont (University of Aberdeen) and Professor Peter McEleavy (University of Dundee) paying regard to the fact that the subject area has been comprehensively restructured in recent years due to the process of Europeanisation. 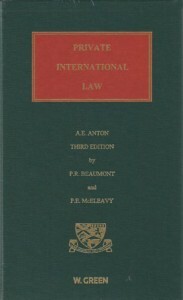 The Brussels I, Brussels IIa, Rome I, Rome II and Maintenance Regulations, as well as associated case law, are considered in detail with regard paid to their particular impact on Scots law. Further, the recent work of the Hague Conference on Private International Law is included, in particular the Conventions on Maintenance, Choice of Court, Protection of Adults, Protection of Children and Inter-country Adoption. In analysing European and global instruments the authors have drawn on their experience in participating in the negotiation processes in Brussels as well as from their work for the Hague Conference . More information can be found at the publisher’s website.